As Samford University’s Class of 1965 celebrated its golden anniversary at Homecoming 2015, professors Delane Tew (history) and Mark Baggett (English) offered a look back at the outsized cultural influence of that era. 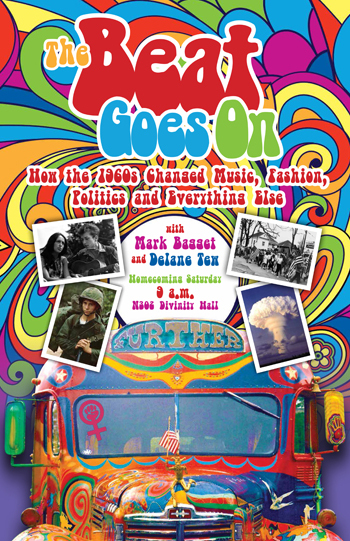 The pair previewed their upcoming course, The Beat Goes On: How the 1960s Changed Music, Fashion, Politics and Everything Else, as part of homecoming celebrations Saturday morning. The pair has created an interdisciplinary multimedia course rich in the music, film and newsreel footage of the revolutionary decade. Their preview at homecoming gave a sense of the overwhelming cultural change of the 1960s, but also emphasized the remarkable unity of purpose in what began as individual movements. From the Civil Rights Movement and Free Speech Movement of college campuses, through the antiwar movement and on to the excesses of counterculture, the professors highlighted the push for personal and collective freedom. Rock and roll, the folk revival and protest music provided the soundtrack, of course, and were bound to all the other revolutions. Many in the audience were at Samford as students and faculty in the period and recalled the university’s own changes. Samford students and faculty took part in the Civil Rights Movement, both off campus and on, and by the early 1970s were leading their own battles for free speech. But even as the world focused on the racist violence of “Bombingham” in the first half of the decade, that world seemed separate from daily life on campus and in many neighborhoods. That’s just one of many questions Tew and Baggett will address with a new generation of students in their new course next spring.